Male and female energies are intertwined in many aspects of life, and within our psyche. The Celts perceived the presence of divine forces in all aspects of nature. Patterns of harmony and balance, of light and dark, summer and winter, male and female, are woven throughout Celtic tradition. The lovers bring the two energies into harmony within the loving passion of the heart. 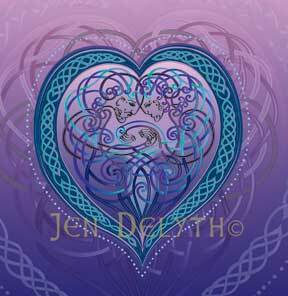 The heart is a symbol of human love since medieval times - the lovers are interconnected within the sacred vessel. In Wales, a wooden spoon - Love Spoon - was elaborately carved from wood as a token of lasting affection by a Welsh suitor for his cariad - sweet-heart.